I adopted Charlie in 2014. My wife and I had fostered him for several months before we decided to adopt him. It was his “hello” nicker every-time I walked out the front door that made my heart just smile! 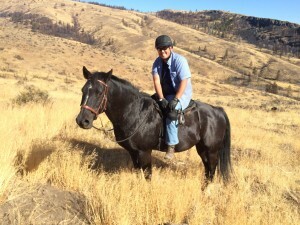 Rodeo City Equine Rescue took in Charlie because his owners were no longer able to care for his chronic laminitis. At times he was very uncomfortable and it was unknown whether or not he would survive his severe case of founder. Despite all the odds, Charlie now has become a fantastic trail-riding companion. With regular hoof care, and a strict diet Charlie can comfortably move around in the pasture and on the trails. It was his will to live that inspired me to never give up trying to give him his best chance.